“The whole experience was wonderful. The room was very homey and comfortable. The wine presentation with different food samples was great. It was difficult to choose which wine we liked best. The manager presented everything really well. We would recommend this wine tasting to all of our friends.” – Terri H.
This is an amazing place. Get ready to be blown away with awesome fruit wines and great hospitality! “If you ever get a chance to stop and do a tasting you will not be disappointed. Every wine we tasted we loved, even the dry and we are sweet wine drinkers.” – John L.
We had a great experience! It was different than other wine tastings in that we got to pair food with the wine. The wines were delicious and we loved tasting the unique ones. The owner was super friendly and taught us a lot. We'll definitely go back when we're in the area to check out their seasonal wines. I didn't even know about Von Klaus Winery Tasting Haus until I saw this Groupon. It was really impressed with the wine and the gentleman who makes the wine (and he was the host and waiter and pretty much everything). We were not rushed at all and the wine was a very reasonable price. I am excited to return sometime and to share the wine with my family. “My husband and I visited the winery for their Von Klaus for Two. We had a wonderful time. We were made to feel very special, the food pairings were great and the wine was fantastic! It was a fabulous start to our anniversary weekend together. I highly recommend a visit. We will definitely be returning.” – Elizabeth K.
What a great experience! Wonderful food and wine pairings in a relaxing, intimate atmosphere. We were welcomed by a friendly and informative host. Great way to to celebrate our anniversaries. The wine was delicious! We will be going back. Thank you for a great experience! Amazingly Delicious!! My husband, a beer drinker, even liked the wine!” – Nikki S.
“I do not get up there often but when I do I make a special trip and I buy as much as I can afford love it love it love it Phenomenal people too !! !” – Bill G.
It was a wonderful experience - they paired the food and wine and encouraged us to try the wine before and after eating. The owner discussed his wine making process and history and was very informative!! Definitely worth every minute and every dollar - and we will go back, with or without a Groupon!! It was a fantastic experience. I will DEFINITELY be going back! It was a calm and relaxing atmosphere and the wine was exquisite! Loved every minute! The experience was great, it's not often that you get the wine maker as your server. We learned so much about the wine making process and his recipes. We took 2 bottles of wine home it was so good. I would love to go again!! We enjoyed our private wine pairing. The evening was relaxing and romantic. Fruit wines and dessert wines are really our preference, so it was good to find a small local family business with so many tasty options! We are looking forward to returning when their new wines will be released. “Love love love the flavors to taste! The pairing deal was fantastic and informative. Ken has been fantastic every time I've been in! !” – Kia B. “Very nice wine tasting experience in a cozy setting. Excellent wines paired with various foods. Friendly vintner with a lot of interesting information.” – Larry M.
© 2014 - 2019 Von Klaus Winery, All rights reserved. Page Summary: Von Klaus Winery offers best wine, wine and food pairings, wine tasting party and cases of wine. Products and services such as food and wine pairings, local winery, good dessert wine as well as wine with food are also part of the scope of our business. 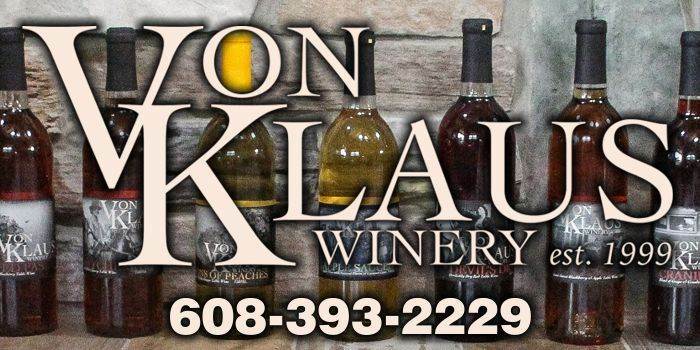 We also specialize in von klaus winery tasting haus, winery tastings in Devils Lake, Sauk County, Lake Delton as well as Sauk City. Other areas we serve include Baraboo, Madison, WI and Reedsburg. We also service Prairie Du Sac, Wisconsin Dells and beyond.